Perfect for Teens and Tweens. In fact, perfect for anyone on the go. 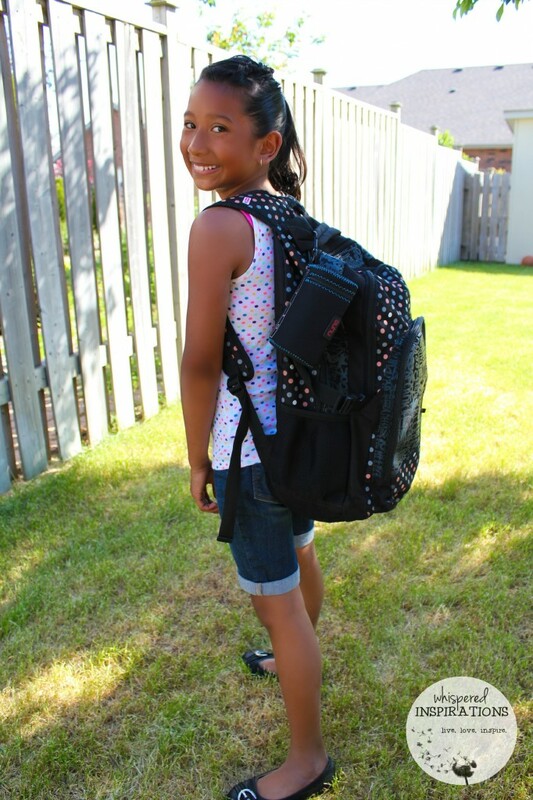 Gabby had the opportunity to test out the NYNE Mini and she absolutely LOVED it. You can see her video review of the NYNE Mini and see how it looks and works. You’ll see that Gabby was moved by the NYNE Mini in more ways than one! It truly is. I come from a family of musicians, unfortunately, I didn’t have the talent to play any instruments (Gabby does) but, I sure do love to sing. With that said, I have passed on the love of music and song to both of my girls. They listen to music every single day. Gabby was stoked to try out this speaker with her iPod. It’s design is sleek and comes in a variety of awesome colors. You will be in shock and awe at the sound that comes out of this little speaker. It is loud and a good kinda loud, it is also adjustable so you don’t have to worry about being TOO loud. While this speaker is perfect for teens and tweens, we have been using at as a family when Gabs isn’t using it. We’ve brought it outdoors while we have backyard patio dinners, we’ve used it while we are in the shower and we have tried it on various different devices, such as: iPhone, iPod, Samsung Galaxy S3, Samsung Galaxy Note and more. It all works and does so flawlessly. Gabby played her favorite play list in her iPod and I listened to my 90’s Alternative Rock on Songza. It can even take calls, so we are always connected. The NYNE Mini is light weight, weighing in at 0.6 lb and since it is made with High Quality Rubberized Finish Cabinet, it is sturdy. Not to mention, it’s pretty stylish and comes in vibrant colors, so your really can’ t go wrong. It is super easy to use, it comes with easy AUX and USB sockets and you literally flick the ON and OFF switch to operate. Connecting is even easier. You just enable the Bluetooth option on your device, find the “NYNE Mini”, click on it and connect. You hit the phone button on top and you are good to go. 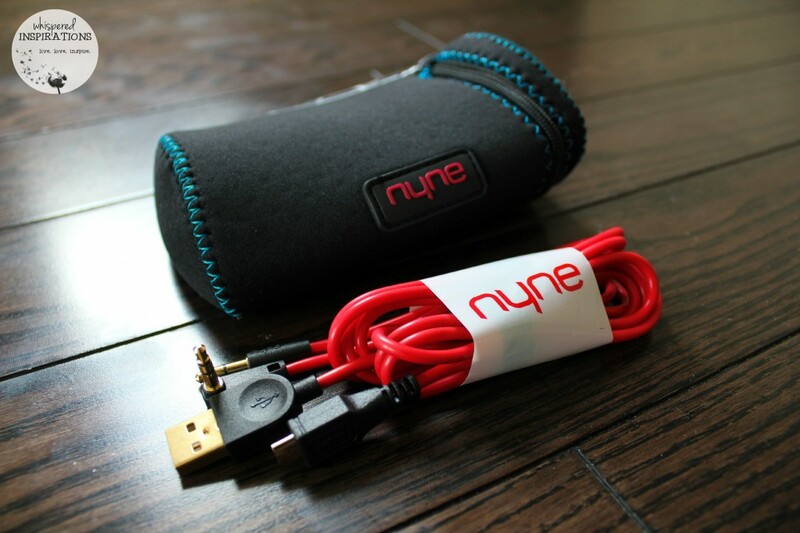 The NYNE Mini comes with a USB Cable, a 3.5mm Aux Cable and a neat Carrying Case. 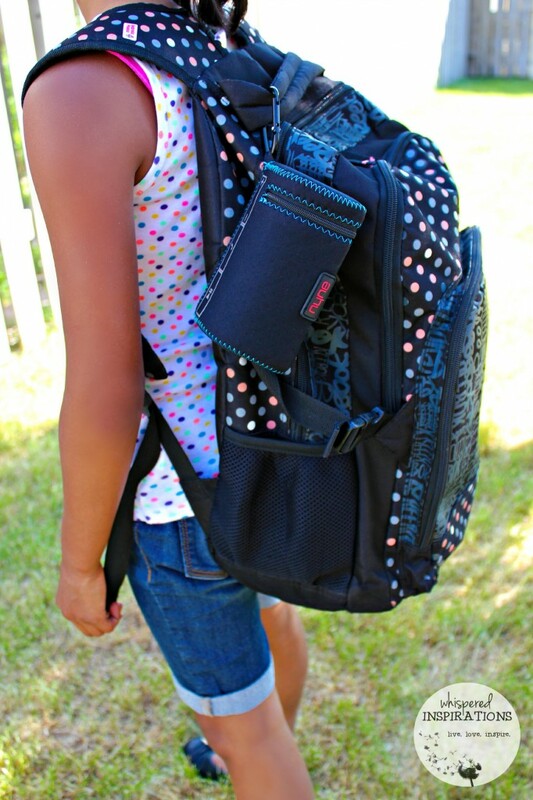 This is perfect for when Gabby goes to school, track meets or pretty much anywhere on-the-go! I love the ability to connect directly to other sources and the ability to amplify our favorite tunes. One of the coolest accessories is the carrying case that the NYNE Mini comes with. The hook is easily attached to your child’s backpack and they can take the tunes with them wherever they go. 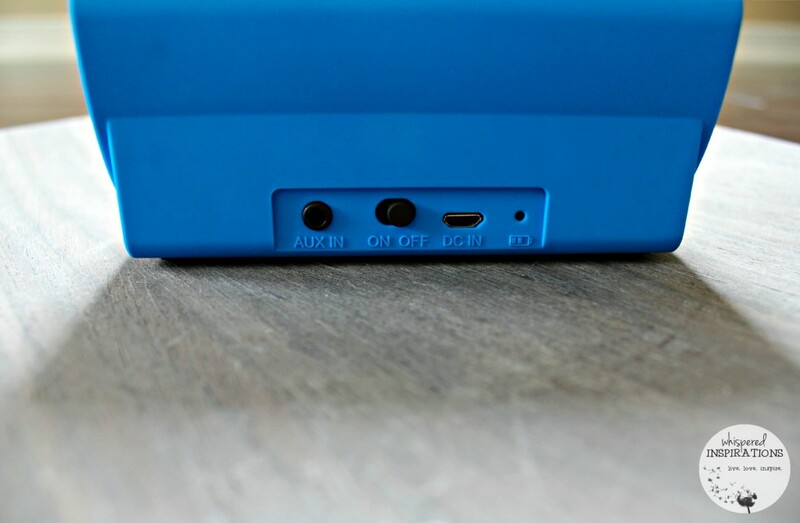 The best part is that you can control your music’s volume, tracks and power–right through the case! Gabby is loving her NYNE Mini and she is always happy to share the tunes with everyone. If you’re looking for a Bluetooth speaker that has nearly flawless sound, kid-friendly and portable. You have it with the NYNE Mini! Perfect for teens, tweens and us BIG kids too! One lucky Whispered Inspirations reader will WIN their very own NYNE Mini. This contest begins on June 23rd, 2014 and ends on July 14th, 2014. Make sure to send @nynemultimedia a tweet or like them on Facebook, here. Connect with them and ask them any questions you may have! Be sure to check out Gabby’s review too, here. 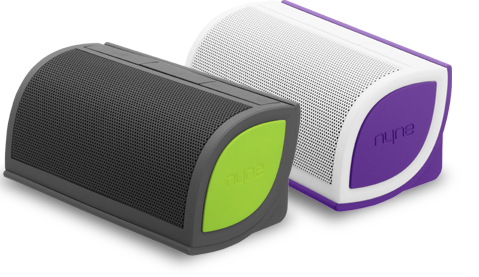 Who’s the music lover that would enjoy the NYNE Mini in your life? I'd love the white and purple, so stylish! I would pick the black silver. Wow this is so cool. I want one! That is great, how love how compact it is in it's own little case! That you can use right through! Looks pretty neat and the colors are awesome – my fav is the black/silver. That is a cool speaker. My kids don't have iPod's yet, but this is good to know for when they do! I need this! I love music, but cell phone speakers are so tinny! This is the perfect solution. This is very amplified, you will love it! It looks like you've got quite the blogger-in-the-making on your hands! She did a beautiful job reviewing her new product on camera 🙂 It really does sound like a very neat product! Thanks so much, she sure loves it. She has her own blog! http://alwaysgabby.com! That is an awesome bluetooth speaker! I love how compact it is too! I would say purple and white! My daughters would squeeee if we got the purple and white! I'd like the black and silver one. this seems great! I am sure my daughter would love to go. This is so cool! I have never seen these before! I like the standard black! Such a cool looking speaker – I really like the shape! That's awesome it's so easy to transport! Super easy, you can hook it up, literally. This looks like an awesome speaker for summer adventures: I love the look of the black and green one! My favorite color is green, so I'd pick the black and green. This sounds great. I need one for my oldest child. Love that it can be controlled right through the case. We need one of these for summer! This looks like an awesome Bluetooth speaker! My daughter loves her Bluetooth speaker but it is starting to sound busted. We will have to look at these. This one is awesome, you will like it. 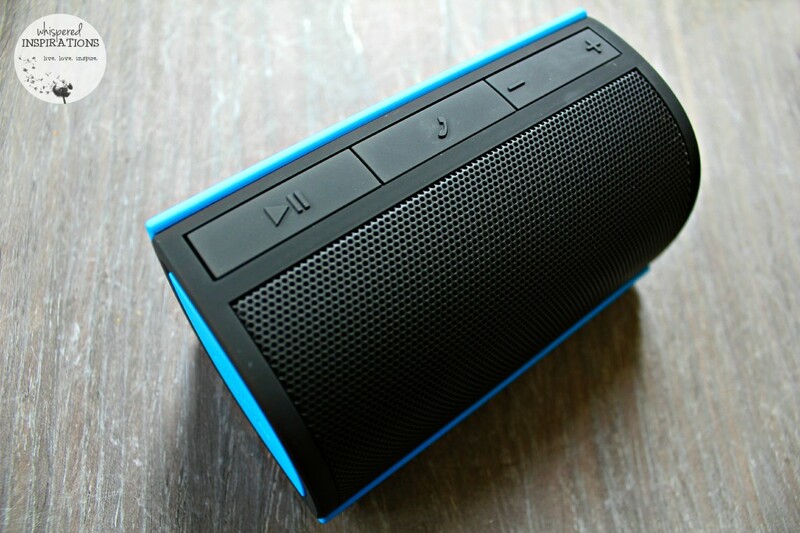 I like the blue NYNE bluetooth speaker! Hope I win – thanks for the chance! Ooh! I would pick the green. The shape of it makes it look like a leaf so it looks perfect in green. These are so awesome and perfect for everyone in the family! Thanks for sharing! My teens would love this…..in fact so would I! I love the fact that it comes with a case and hooks onto a knapsack. I always steal Gabby\’s… Shhhh. Awww, I love this! They'll be the most popular kiddos at the bus stop! My pleasure, I am positive she would. I like the sleek look of that speaker. I would go with the purple, my daughter LOVES purple. I think I would choose the blue. That bluetooth speaker looks really cool. Thanks so much, she loved it! Black & blue looks cool! What a fun speaker, I love using my phone to listen to music. I love how small this is – it'd be perfect for so many outdoor occasions! I want one of these too! Thanks for the giveaway. I'd love the Black and Blue one! That is really neat. I know my kids would get a kick out of that speaker. I'd choose Black & Blue! This is really a cool little product! Thank you for sharing about it! Thanks so much, it is awesome. that looks really cool. i love mini speakers, they are so good for travel. The fact it can travel with you like that is a plus! It sure seems easy to connect too, plus it's good looking. I would like the Black & Blue one. Love the white and purple! My girls would love purple and white. This would be perfect for them. I'd like the black colour! Such a cool little device! I would pick the the black and silver! Although I really wish they had a black and purple one. Thanks so much for the chance! 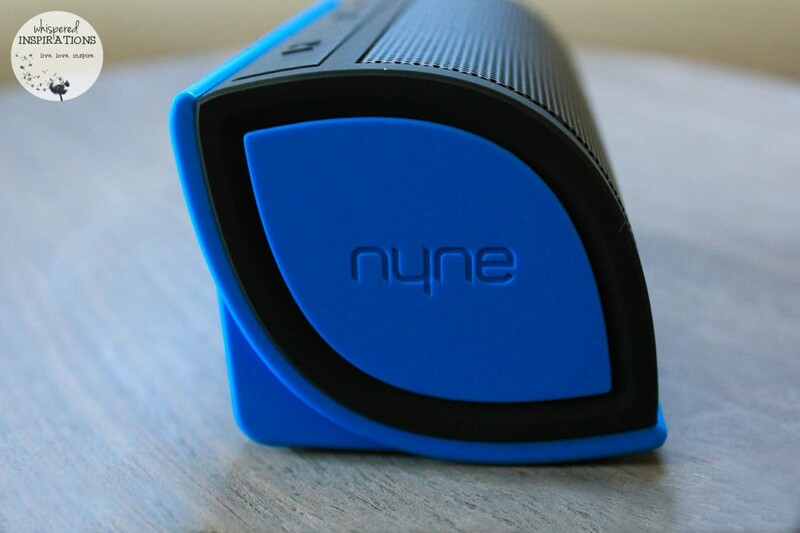 I would love the blue/black NYNE Mini Bluetooth Speaker. That lime green/black looks nice. Black and Silver is very nice! I like the black and blue! Blue is my colour , so the black and blue one would be my choose. What an awesome prize!! I love the black and blue! It would be great to win the NYNE Mini BlueTooth Speaker. Which color of the NYNE Mini would you like? I would like one in Black And Silver. I really like the black & blue what a fresh look! That looks like such a fun Speaker, and she did a great job in the video!!! I love how it hooks to her bag!